Vertical Markets! 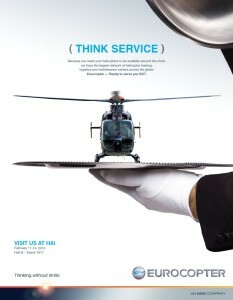 A New Aviation Advertising Campaign Launches. Our latest headline news is our proud announcement of a major new client win with our award by Eurocopter of a 3 year contract for their new global aviation advertising campaign. 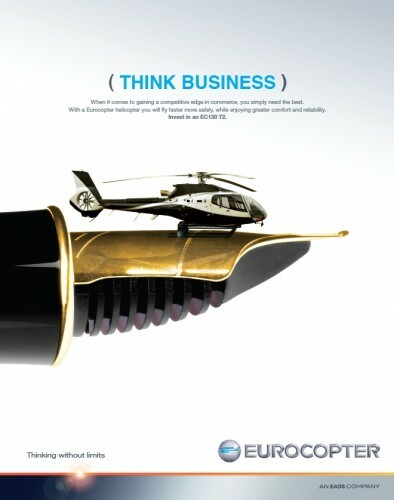 The 5-way pitch winning campaign concept demonstrates how Eurocopter looks at things differently; resulting in innovation, service and a mission focus in their helicopters. As the brief was for a memorable advertising campaign with standout. We made heroes of the products by taking the expectation challenging Eurocopters and putting them into even more challenging settings. For example shrinking the helicopter down in size mirroring the company’s investment in nanotechnology so it can land on the nib of a pen or enlarging it – so like their extensive service networks it can reach across a whole continent. All the campaigns featured are integrated and include supporting elements such as animated online ads. The campaign is currently taking off around the world in aviation magazines like Flight International and in animated form on aviation media and exhibition websites like HAI Heli Expo in Houston. View Eurocopters campaign launch page here. 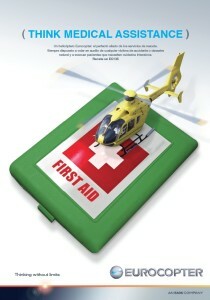 View our aviation marketing portfolio. Design Inc UK is a West London-based advertising agency. If you’re considering new aviation advertising campaign, please contact us by calling 01784 410380 or emailing us to find out more.